American pedalmeisters Pigtronix have just revealed a new trio of stompboxes that handle boosting, gating and octave manipulation. Pigtronix have just dropped three new pedals on the market. Aside from taking up a small amount of real estate, they cover boost, noisegating and octaves. 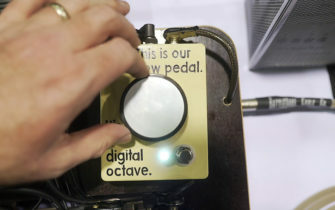 The Octava Micro features true bypass, low-pass filter a master blend, with drive and a switchable fuzz that can be added to the octave effect. The Class A Boost Micro offers up to 20dB of clean boost, meaning that you could fit it in among overdrives or distortions to provide extra aggression and crunch. With all those extra pedal tones, noise can build up. The Gatekeeper Micro is a simple, true bypass unit with adjustable threshold and release controls to clean up any unwanted buzz from the pedal chain. Check out the Pigtronix website for more details.